100-watt, dual-channel head expands on the company’s popular Kraken. Victory Amps has announced the VX100 The Super Kraken. 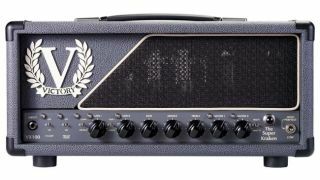 The new 100-watt, dual-channel, three-mode, 4 AX7/4 6L6-loaded head expands on the company’s Compact Series VX The Kraken. Updated features include a new footswitchable clean mode, plus a footswitchable Preamp Focus function that adds “juice and cut” to any and all modes. There’s also a preset Bass Focus option in the power section, footswitchable FX loop, assignable/ footswitchable dual master volumes a 30-watt low-power mode and MIDI switching capability. The Super Kraken is available for $1,899. For more information, head over to VictoryAmps.com.